To appeal clearly and compellingly to its customers, the Company uses two brands – BOSS and HUGO. 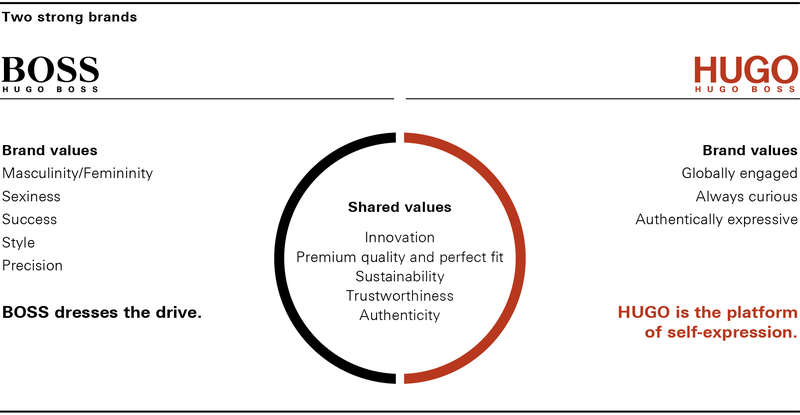 Although the two brands are clearly distinguishable from each other in terms of their individual attributes and address different customer groups, they both embody the same exacting values in terms of quality and fit, innovation and sustainability. With its BOSS brand, the Company is reaching out to status-oriented, rationally-minded customers who wish to dress in a classic yet modern and high-quality style. The BOSS customer has exacting standards when it comes to quality and fit, and attaches great importance to an adequate value-for-money proposition. The shopping experience must also meet the highest standards, particularly with regard to personal service. BOSS offers this customer confident businesswear and refined casualwear collections in the upper premium segment, characterized by the highest quality, elegant cuts and clear designs. As a response to a modern lifestyle, the stronger interplay between modern ready-to-wear and casualwear elements, flexible suit combinations, for example as part of the “Mix & Match” assortment, and the strong integration of performance elements, such as suits under the “Stretch Tailoring” program, are gaining increasing importance. Building on its many years of experience and its comprehensive apparel offering, BOSS likewise hopes to generate growth in the area of shoes and accessories. In 2018, BOSS enhanced the quality of its offering in the entry-level price range of the upper premium segment, thus enhancing the value proposition of its collections. The BOSS Tailored line addresses heightened customer expectations with respect to tailored fashion and casualwear. Produced as an exclusive edition in Germany, the full canvas suits symbolize the precision design and masterly workmanship for which BOSS is known and feature the best possible comfort thanks to their unique flexibility. The same quality of workmanship is found at the top of the collection in the personalized “Made to Measure” range comprising suits, shirts and shoes. These products are fitted and tailored individually, setting the customer apart from mainstream fashion. The repositioning of the BOSS brand is being accompanied by numerous events and campaigns. BOSS is regularly presented as part of prestigious fashion shows. In 2018, BOSS Menswear and BOSS Womenswear presented their new collections together again for the first time at the New York Fashion Week. A 360° approach is intended to ensure the consistency of marketing campaigns, from web and social media appearances through external advertising to window displays in retail stores. The Company will increasingly use social media campaigns in future to step up interaction with consumers via digital channels. The Company also sponsors premium sports such as golf, sailing, motor sports and soccer to convey brand values such as success, precision, innovation and sustainability. As part of its collaboration with auto manufacturer Porsche in Formula E, BOSS will offer a specifically developed capsule collection of different menswear styles in the first half of 2019. In contrast to BOSS, the HUGO brand is targeted at customers who are significantly more fashion-conscious and consider their style of dress to be an important element in expressing their personality. The HUGO customer is open-minded, individual and spontaneous, and likes to shop, frequently doing so via online and mobile channels. HUGO offers this broad and generally younger customer base fashionable business and casualwear collections that are distinguished by their progressive designs and clear fashion statement. In doing so, HUGO remains anchored in the premium segment of the market. With its focus on contemporary fashion, however, the brand stands apart from BOSS in terms of its fashion statement and pricing. Thus, HUGO prices are up to 30% lower globally than BOSS prices. The Company expects to achieve an overproportionate increase in sales of the HUGO brand by 2022. Numerous events and campaigns are being used to intensify the positioning of HUGO. In doing so, the Company is factoring in that the buying behavior of the HUGO customer is more digital oriented as compared to the BOSS brand. Thus, for example, last year’s HUGO Menswear and Womenswear fashion show at the Berlin Fashion Week was accompanied by a comprehensive digital campaign. The show was livestreamed on the website and on social media. As part of its social media activities, the Company is increasingly entering collaborations with fashion bloggers and influencers, particularly for HUGO. These activities are growing market reach and enhancing brand awareness and credibility. Womenswear accounted for 10% of Group sales in 2018 and is an important part of the HUGO BOSS business. In terms of both fashion and price, the positioning of the two brands BOSS and HUGO in womenswear mirrors that of menswear. A greater simplification of color and theme concepts is improving the consistency of the menswear and womenswear collection statements. At the same time, the fashion elements in parts of the collection will be increased substantially. The expansion of so-called capsule collections and collaborations with brand ambassadors offer attractive growth opportunities. For instance, in 2018, the Company launched the “Made in Germany” collection, a selection of pieces, six for men and six for women, designed and produced exclusively in Germany. As faces of the campaign, BOSS chose German top model Toni Garrn and Hollywood actor Daniel Brühl.